Wound infections result from contaminating an existing open wound with seawater harboring the organism, or by cutting part of the body on coral, fish, fishhooks, etc., followed by contamination with the organism. Also, people who consume foods contaminated with this organism are susceptible to gastroenteritis, which usually develops within 16 hours of eating the contaminated food. They experience vomiting, diarrhea, and abdominal pain. Many patients develop distinctive bullous skin lesions. The bacterium invades directly from the GI tract or broken skin to produce bacteremia and septicemia. Invasion is characterized by the occurrence of blister-like skin lesions or bullae, and rapidly-spreading necrosis resembling necrotizing fasciitis. Figure 2. A. Characteristic skin lesions associated with Vibrio vulnificus infection on the leg in a 75-year-old patient with liver cirrhosis in whom septic shock and bacteremia developed. B V. vulnificus bacteremia developed one day after a fish bone injury on the fourth finger of the left hand (arrow) in a 45-year-old patient with uremia. C. Gram-negative curved bacilli isolated from a blood sample of the 45-year-old patient with uremia. Photos from Hsueh, et al. Vibrio vulnificus in Taiwan. CDC Emerging Infectious Diseases Volume 10, Number 8, August 2004. Attempts to associate phenotypic or genotypic characteristics of Vibrio vulnificus with strain virulence have been largely unsuccessful. V. vulnificus exhibits considerable strain-to-strain variation in virulence. More than 100 strains of the bacterium have been identified, and it is possible that many thousands more exist. The bacterium also exhibits a large number of potential determinants of virulence, on the order of V. cholerae and Pseudomonas aeruginosa combined, but their role in disease has not been elucidated. There are at least three ways that Vibrio vulnificus strains have been divided into two "biotypes", one of which is pathogenic for humans, and the other of which is found in shellfish or fish, or is free-living. One way is based on the difference in a 17-bp nucleotide sequence of the 16S rRNA gene. By this criterion two major groups of V. vulnificus have been identified, designated types A and B. The majority of nonclinical isolates are type A, and there is a positive correlation between the type B genotype and the cause of human disease. Similarly, a homogeneous LPS type is found in vibrios that live in associations with eels (biotype 2), and distinct heterogenous LPS types are observed in clinical isolates (Biotype 1). The presence of a capsule occurs in virulent strains, and noncapsulated strains are nonvirulent. The significance of these observations is not known, and they do not explain how the bacteria are able to switch from free-swimming and colonizing oysters to colonizing human tissues. Many of the heat shock proteins produced by V. vulnificus, such as the chaperonins DnaK and GroEL, and the proteases, Clp and Lon, are induced by environmental changes other than increased temperature, such as ethanol, heavy metals or oxidizing agents, high osmolarity, pollutants, starvation, exposure to low temperature, or interaction with eucaryotic hosts. This is thought to be a generalized stress response in the bacterium. Through a process termed cross protection, this response improves the bacterium's thermotolerance, salt tolerance, tolerance to heavy metals and UV exposure, and starvation survival. The generalized stress response may be critical for bacterial adaptation to changes in the environment and is a major link between bacterial ecology and bacterial pathogenesis. Stress is also thought to cause genomic differences observed among strains of V. vulnificus. Genomic differences may be the result of gene rearrangements in the bacterium. Since the bacterium may exist in a rapidly changing ecosystem where major alterations in temperature, salt concentration, UV irradiation, and nutrient availability are routinely encountered, it is possible that such gene rearrangements may increase the chances of survival of the bacterium when it moves from water to oyster to human. Expression of a polysaccharide capsule is necessary for virulence of Vibrio vulnificus. The noncapsulated form is nonvirulent. Under laboratory conditions, acapsular variants arise at a fairly high frequency (~1/100), with certain environmental stresses dramatically increasing this switch rate. Once such noncapsulated (translucent) colonies arise, they do not appear able to revert back to the capsule-expressing (opaque) morphology. The mechanism of this capsule switching has not been explained. Type IV pili (fimbriae) are required for virulence. Type IV pili are equivalent to N-methylphenylalanine pili, characteristic of vibrios, that allow the bacteria to adhere to epithelial cells. The receptor has not yet been identified. The N-methylphenylalanine pili of Vibrio cholerae apparently utilize N-acetylneuraminic acid (sialic acid) as a receptor. Figure 3. 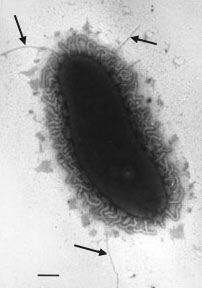 Electron micrograph of Vibrio vulnificus. The arrows mark fimbriae (pili) of the bacterium. The laboratory of Dr. Mark Strom at the NOAA Northwest Fisheries Science Center is studying how the adhesins of the bacterium, which include fimbriae and other cell surface components, influence the course of mammalian colonization and infection, as well as the organism's ability to colonize and persist in shellfish. As a Gram negative bacterium, V. vulnificus lipopolysaccharide (endotoxin) is expected to play a role in fever and septic shock brought on by infection. On the basis of lipopolysaccharide (LPS) antigens, the species can be organized into three biotypes. Biotype 1 is the predominant human pathogen; biotype 2 is associated with eels; and biotype 3 was recently isolated from fish handlers in Israel. Biotype 2 consists of a homogeneous type of LPS, and although Biotype 1 was originally divided into 5 antigenic subgroups, other subgroups are known to exist. Biotype 1 is almost invariably associated with human disease, and one particular LPS type (1/5) is significantly more prevalent among clinical strains. This suggests that either the presence of this LPS type itself causes increased virulence, or that the LPS type is a marker of more virulent strains. Besides attachment ability, capsule switching, LPS, and the ability to undergo the stress response, other properties of V. vulnificus that have been considered as determinants of virulence include production of alternate (stress) sigma factors, SSR repeats, motility, quorum sensing, production of a siderophore and a hemolysin (cytolysin), and numerous extracellular enzymes, including proteases, collagenase, mucinase, esterase, chondroitinase, hyaluronidase, DNAase and sulfatase. A recently identified determinant of virulence in Vibrio vulnificus is the member of the RTX family of toxins produced by a limited group of Gram-negative pathogens. RTX toxins cause pore formation in red blood cells, necrotic death of Hep2 cells, and depolymerization of actin in HeLa cells. For an excellent review of the virulence of Vibrio vulnificus see Gulig. et al. Molecular Pathogenesis of Vibrio vulnificus (2005).